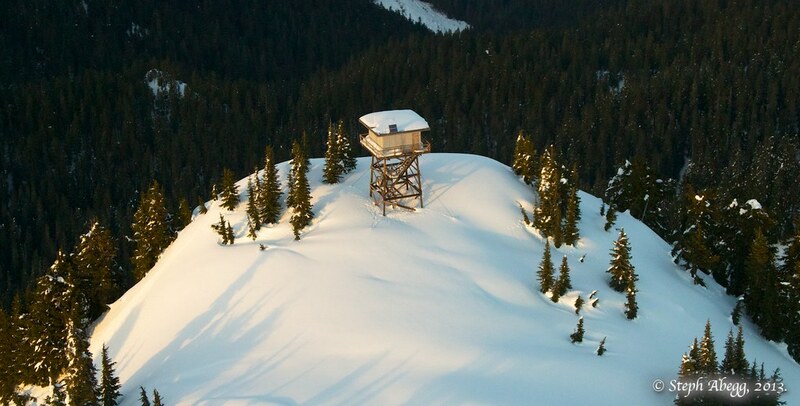 As of 2013, 87 fire lookout structures remain standing on the tops of rugged summits across the state of Washington. This page provides some history, locations, and photos of these last standing sentinels of Washington's past. 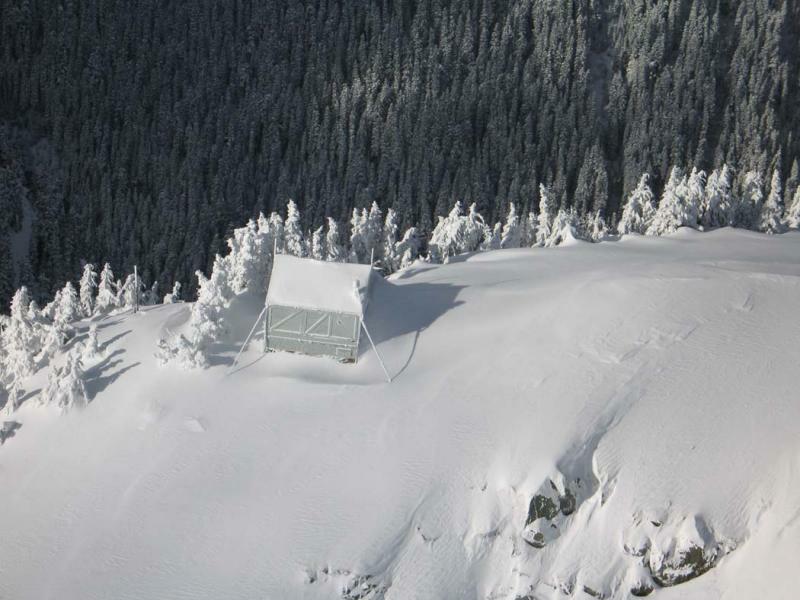 Aerial photo of Green Mountain Lookout, December 8, 2013. Inside the Three Fingers Lookout, September 11, 2008. 2014 Update: Possible corrections to the fire lookout list on this page: On August 3, 2014, fire lookout enthusiast Craig Willis became the first (documented) person to visit every standing fire lookout in Washington. He claims some minor differences between his list and mine, to bring the total standing lookout structures to 93. In the interest of being as up-to-date and correct as possible with the information I put on my website, I have included at the end of this page Craig's detailed notes of the differences between his list and mine. Devastating fires, such as the Yacolt Burn of 1902, inspired the construction of a vast National network of fire lookout stations in the 1920s. The job of a lookout was to spot and report fires by telephone or radio so crews could be dispatched quickly. At the system’s peak, there were 5,000 lookouts nationwide—including 685 overlooking the extensive forests of Washington. The highest lookout was at 12,276 feet on Mount Adams, but it was used for only three seasons, then abandoned to the year-round ice. The most difficult to reach was Three Fingers; the approach was (and still is) a series of ladders spiked into a 100-foot rock wall. By the mid-1970s, most lookouts had been abandoned as fire-detection began to rely more on technology and aerial reconnaissance. Some lookout structures were deconstructed by government agencies worried about liability, some have been left to rot, and some have been restored and are maintained by hikers. 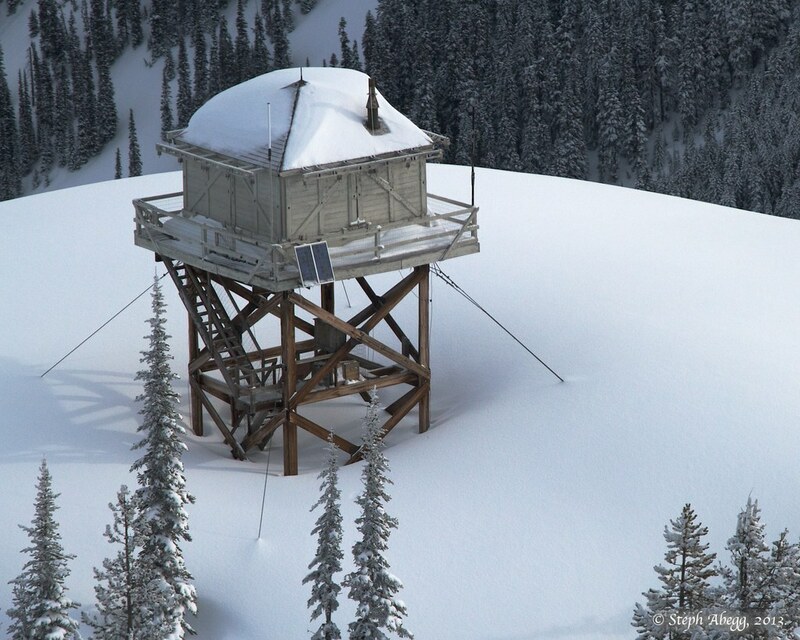 As of 2013, Washington has 87* fire lookout structures still standing in their original locations, with less than 30 of those still actively used for firefighting. In addition, there are some old lookouts that have been moved to museums. Most—though not all—of the standing lookouts in Washington are listed in the National Historic Lookout Register. 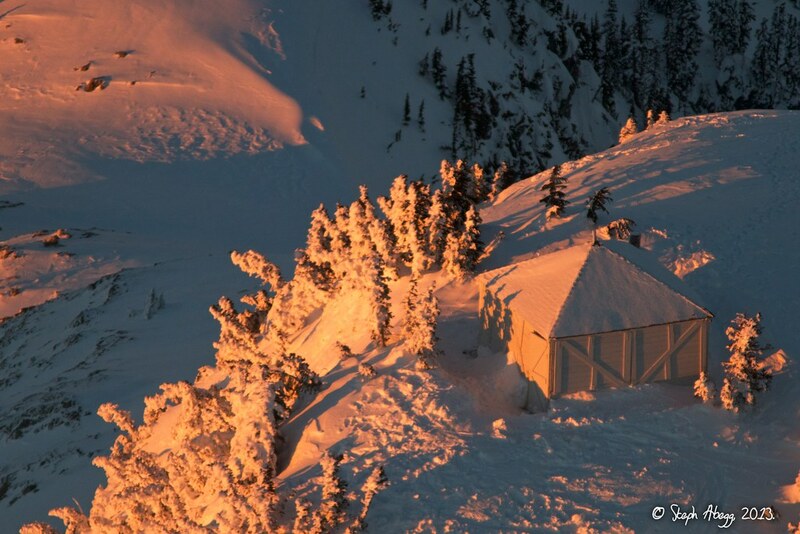 Many are the remaining fire lookouts in Washington are located on rugged summits overlooking the forests of the Cascade Range. Several more are located in the northeastern reaches of the state, and a handful continue to stand above the forests of the Olympic Range and the southeast corner of the state. Each one of these lookouts is a unique hiking destination. Not only are the lookout sites a unique part of Washington’s history, but they also all have spectacular views. 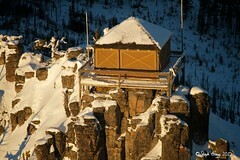 Some of the standing lookouts even have beds and stoves for a first-come, first-serve overnight stay. *When I first began researching fire lookouts in 2010, there were 92 lookouts still standing in Washington. Five (Kloshe Nanitch and Lone Mountain on the Olympic Peninsula, Pine Mountain and Sopelia near Yakima, and Flagstaff in Colville/Kaniksu NF) have since become "standing no more." As the years progress, more lookouts will inevitably fall into unrecoverable disrepair. Also, it is likely there are a few obscure standing lookouts that are not identified on this page. I try to keep my fire lookout records as accurate as possible, so I would appreciate being notified if/when any more of the remaining 87 fire lookouts are no longer standing. Map showing locations of fire lookouts still standing (87 as of 2013) in WA. Tabulated by region, for the lookouts that are still standing (87 as of 2013) in WA. -122.831031	 2407	 Built in the mid-1930s by the Civilian Conservation Corps, this 45' stone tower with live-in top floor observatory served as a state lookout until the mid-1960s when the number of tourists interfered with the firewatcher's duties. 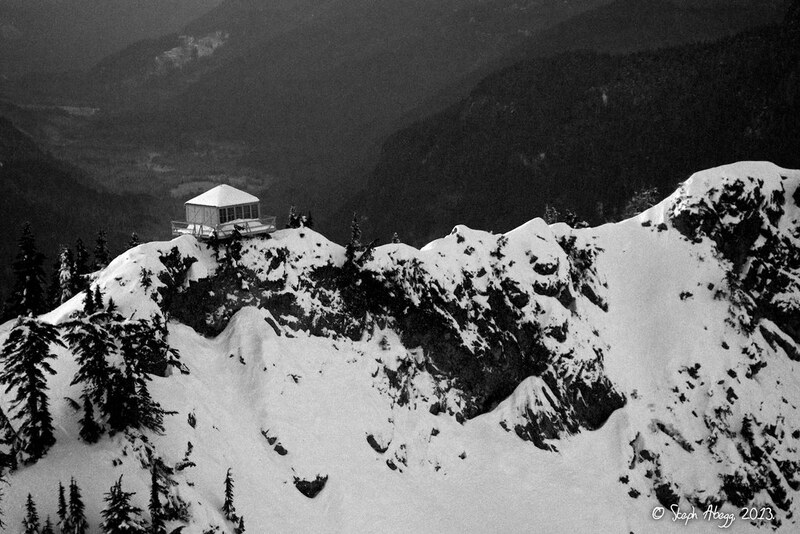 This prompted the construction of Little Summit Lookout 1.5 mis to the south as a replacement in 1966. Constitution's stone fortress continues to be a popular tourist destination in the San Juan Islands and is listed on the National Historic Lookout Register. -123.50991	 5753	 1933: L-4 cab. Emergency. -123.17217	 3450	 This pole platform tower, built in 1933, has been abandoned for many years but is still there. -124.07233	 3340	 This L-4 cab, built in 1939, was abandoned as a lookout in 1969. It has since been converted to a radio communication building. -123.80803	 3000	 1942: cabin. Abandoned 1945. Still there 1980s. -121 27.7	 6260	 Built about 1932, this gable-roofed L-4 cab is staffed every summer and is listed on the National Historic Lookout Register. -121.016121	 6102	 Built in 1932, this L-4 ground cab is staffed in the summer. The summit was made famous by writer Jack Kerouac. The cabin is listed on the National Historic Lookout Register. -121.263738	 5587	 This L-4 cab, built in 1935, was staffed into the 1980s. The lookout was restored in the 1990s, and is listed on the National Historic Lookout Register. -121.48121	 5629	 Developed about 1920 with a cabin, an elevated D-6 cupola cabin was constructed in 1924. The present 10' treated timber L-4 tower, built in 1955, is presently cared for by volunteers. -121.238447	 6500	 Established as a camp in 1919, this L-4 cab, built in 1933, was staffed sporadically into the 1990s. It is listed on the National Historic Lookout Register and the National Register of Historic Places. After a botched attempt to restore the cabin onsite, winter damage necessitated removing the entire structure by helicopter for offsite restoration. There was also a shake cabin added just below in the summit in 1942 which has since been removed. 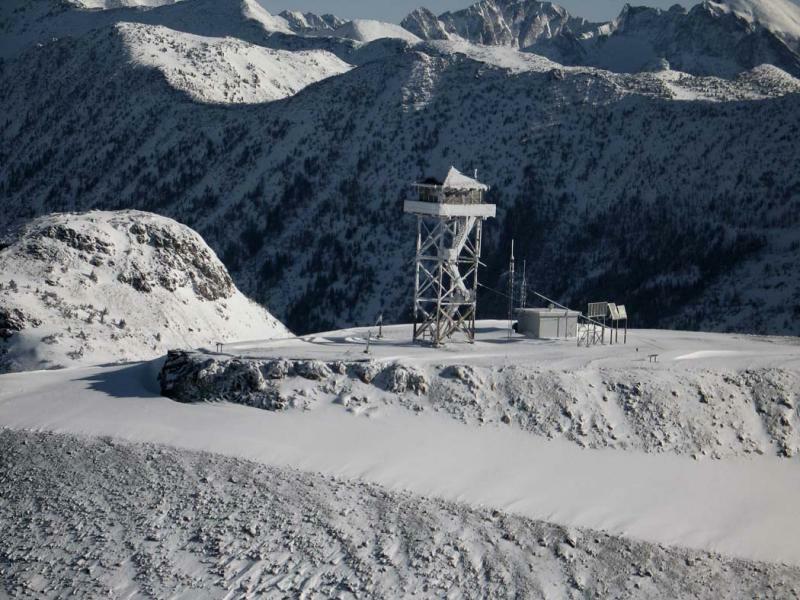 -121.52537	 1701	 Certainly one of the lowest elevation stations in the Washington Cascades, Heybrook was developed in 1925 with a platform tower, replaced by a 45' tower with L-4 cab in 1932. In 1964, the present 67' treated timber tower was built with an R-6 flat cab. Promptly abandoned in 1970, volunteers worked on constructing a new cab during the late 1990s. The lookout may be added to the Recreation Rental program in the future. -121.204862	 6809	 Built in 1931, this gable-roofed L-4 cab was last staffed in the 1950s. 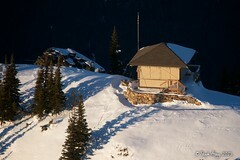 It is presently maintained as an emergency hiking shelter, and is listed on the National Historic Lookout Register. -121.49036	 5409	 A cupola cabin was built here in 1926, replaced by the present L-4 cab in 1950. It was last staffed in the 1980s. -121.32929	 5719	 Established in 1929 with a 2-story "cathedral" cabin, the present 1962-constructed 30' treated timber R-6 tower, is open to the public on a first come, first serve basis. -121.028847	 6210	 First developed about 1926 with a 10x10' shake cabin, a 20' treated timber tower with L-4 cab replaced it in 1938. The present 20' treated timber tower with L-4 cab, built in 1953, is staffed by volunteers. The tower is on the National Historic Lookout Register. -121.60171	 3824	 While other neighboring summits were having their towers permanently removed, North Mountain's first fire observer did it the old-fashioned way: in a tent. The year was 1962, and through 1966, a camp was the home to North Mountain's lookout. A 41' treated timber tower with R-6 cab was constructed in 1966, and remained active through the 1980s. The tower has been plagued by vandalism, but is occasionally used on an emergency basis. -121 51.358	 5450	 Built in 1933, this L-4 cab was last manned in the 1960s. It is presently maintained by volunteers and is open to public use. -121.797754	 5324	 First used with a D-6 cupola cabin in 1921, the present L-4 cab, built in 1938, was last staffed in the 1960s. The lookout was restored in the 1990s, and is listed on the National Historic Lookout Register. -121.109293	 5985	 Developed in 1917 with a cupola cabin, the present L-4 ground cab was built in 1933 and is listed on the National Historic Lookout Register. It is staffed every summer. -121.596386	 5271	 The present L-4 cab, built here in 1934, is on the National Historic Lookout Register. It is used for emergency purposes. -121.687642	 6854	 Built in 1931, this gabled L-4 cab was abandoned in 1942. Restored in the 1980s, it is listed on the National Historic Lookout Register. -121.642859	 6521	 This L-4 cab, built in 1935, was last staffed in the 1960s. It has recently been restored, and is listed on the National Historic Lookout Register. -120.865606	 6237	 Established with a camp in 1920, an L-4 cab was built in 1936. This was replaced by the present R-6 flat cab in 1975. The roof has since been modified. It is staffed every summer and is listed on the National Historic Lookout Register. -121.03159	 5670	 First developed about 1923 with a D-6 cupola cabin, an R-6 flat cab replaced it in 1958. The lookout has been used sporadically since the 1960s on an emergency basis. -120.760629	 5361	 First developed with a cabin in 1924, replaced in 1928 with a cupola cabin, the present 10' treated timber tower with L-4 cab, built in 1952 had stood abandoned since the 1970s. The lookout was totally restored from 1996-1997, and is "staffed" as an interpretive site during the summer. -120.34425	 2586	 This small bump in the mountains of central Washington is actually one of the most strategically located lookouts on the Wenatchee National Forest. Steliko began as a camp in 1925. The present structure, a 10' L-4 built in 1947, is used for emergency detection, usually during lightning storms. -120.527704	 5814	 First used for fire detection in 1914, Sugarloaf has had a long history. The first station was a camp. In 1924, a D-6 cupola cabin was added. This was replaced in 1949 with the present L-4 cab, which was moved from Lion Rock, where it had been built in 1932. The lookout was threatened by the Tyee fire in 1994. While the cab survived, the outhouse didn't. The lookout is on the National Historic Lookout Register, and is staffed every summer. -121.2071	 5854	 This gable-roofed 1930 L-4 cab is one of the few remaining examples of its kind left in the Northwest. It has been staffed off and on over the last several years, and is on the National Historic Lookout Register. -120.471109	 6654	 This ground-mounted L-4 cab, which replaced an earlier 1931 L-4 cab, was built in the 1950s. It was threatened by the massive Tyee-Hatchery Fire in 1994 (the outhouse was burnt to a crisp). It is presently used during periods of high fire danger and lightning activity, and is listed on the National Historic Lookout Register. -121 40.506	 7181	 This typical National Park Service-style 2-story frame cab, atop the north end of a spur 3/4 of a mi north of the actual summit, was built in 1934. -121 54.850	 5485	 Built in 1933, this 2-story frame cab was staffed into the 1980s. -122.64638	 480	 This 100' wooden tower with 8x8' cab, built in 1955, has been abandoned since 1970. Located on the Fort Lewis Military Reservation, the structure has been threatened with demolition in recent years. -122.017157	 4930	 Built in 1964, this 20' wooden DNR tower has seen only limited use during its lifetime. The tower was to be moved to the Pierce County Museum, but Salmon River L.O. was moved instead. Access to the site is through timber company lands and is not generally open to the public. The lookout is listed on the National Historic Lookout Register. -121.530449	 5846	 This 2-story frame cab, built in 1932, was staffed into the 1980s. It is listed on the National Historic Lookout Register. -121.88087	 5939	 Built in 1933, this typical National Park Service-style 2-story frame cab shows some obvious signs of wear and tear. 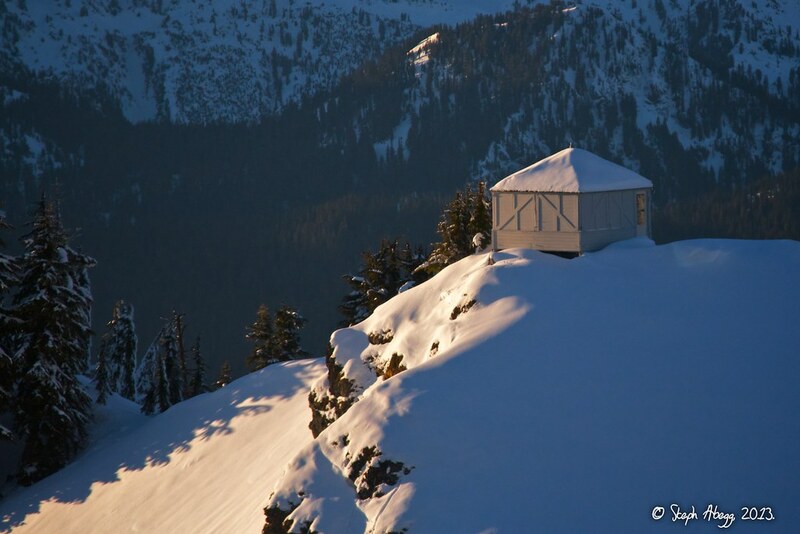 -121 29.45	 12276	 The highest lookout site in Washington state, construction began on the D-6 cupola cabin in 1918, but continued for 3 years. The lookout was staffed from 1922-1924 then abandoned. Sulfur miners took over the cabin in the 1930s, adding a couple of additions and recycling the cupola in the process. The cabin is still there, encased in ice most of the time. -121.8641	 5304	 Built in 1934, this L-4 cab has been staffed in recent years during the summer, and used as a rental during the off-season. It is listed on the National Historic Lookout Register. -121.9	 5685	 Built in 1930, this gable-roofed L-4 cab atop a 1/2 story base is staffed during the summer. -120.7942	 2291	 Developed in 1937 with an L-4 cab, a DNR cab replaced it in 1954. The present DNR live-in cab atop a 10' concrete slab base, built in 1974, was last staffed in the early 1990s. -121.41152	 3620	 This cab built atop an 86' pine tree in 1944 was constructed primarily to watch over railroad logging operations in the area. It had a tent cabin for living quarters. The lookout was abandoned in 1958 but is still there. -121.820929	 4968	 Established with an 8x8' cedar frame cab in 1910, a cupola cab replaced it about 1919. An L-4 cab along with a garage followed it up in 1935. The garage was converted to living quarters in 1942 when the lookout was used for the Aircraft Warning Service during World War II. In 1959, the present 10' treated timber tower with R-6 flat cab was constructed. Strong winter winds blew the roof off in December 2006, collapsing the cabin walls. -120.75337	 4182	 Satus Peak may well be the windiest lookout site in the world. In 1920, a cabin was built, replaced by a 10x10' cab in 1933. In 1957, another cab was constructed, quickly replaced by a heavy timber and frame cab in 1960. Then a steel & wooden cab atop 4' concrete pillars was built in 1967. The present 2-story concrete base with heavy steel cab, built in 1976, was constructed of reinforced iron beams and walls, and the airtight windows are steel-framed triple strength Thermopanes. All previous structures were so severely damaged by the incessant wind, each needed to be replaced. Only the outhouses have been replaced more than the lookout. Over a dozen different ones have blown away. The lookout is staffed every summer. -121.13727	 5100	 Developed by a limber pole tower and tent in 1920, this 3-legged 55' wooden tower with 8x8' cab along with ground house living quarters, were built in 1935. The tower was replaced in 1964 by a 68' all-steel tower moved from Panther Creek L.O. It is presently available for emergencies. -121 57.630	 4664	 Established in 1933 with an L-4 cab, a cabin was added in 1940. The present 20' wooden DNR live-in tower, built in 1963, current houses radio communication equipment. -119.622164	 5167	 First used as a camp lookout in 1916, followed by a log cabin with roof platform in 1920, a 20' pole tower with L-4 cab in 1934, and a 40' wooden tower with DNR live-in cab in 1958, a 42' wooden DNR live-in tower was constructed in 1980 and is listed on the National Historic Lookout Register. The summit has been continuously staffed every summer since 1916! -119.122057	 7258	 Establish in 1914 with a 12x12' slant-walled cabin (still there) and 15' covered platform, a 16' wooden tower with Region 5 cab replaced it in 1930. The present 20' treated timber tower with R-6 flat cab, built in 1961, is staffed every summer. It, along with the original 1914 cabin, are listed on the National Historic Lookout Register and the 1914 cabin is on the National Register of Historic Places. -119.8227	 6135	 Started in 1919 with a crow's nest tree lookout and a log cabin, a 20' pole tower with L-4 cab was built in 1934. The present 20' wooden tower with live-in cab, built in 1961, is used periodically during the summer to detect fires after lightning storms, and is listed on the National Historic Lookout Register. -118.8904	 5088	 A relative late-comer to the lookout age, this 42' all-steel live-in tower built in 1958 was purchased by a private party for removal in 1996. As of last report, the tower is still on the summit. -120.1076	 5491	 This 28' treated timber tower with L-4 live-in cab, built in 1938, was staffed every season through 1997. It was used only for emergencies in 1998, but was once again staffed 5 days a week during the 1999 fire season, and continues to be staffed in the summer. The tower is listed on the National Historic Lookout Register. -119.7434	 5122	 Started about 1914 with a crow's nest tree platform (still there), L-5 cab living quarters were added in 1935. The present 40' treated timber tower with L-4 cab, built in 1943, has been used for emergency detection during the summer, and was staffed fulltime in 2000. It is listed on the National Historic Lookout Register. -120.4027	 7001	 Built in 1950, the present 15' timber L-4 replaced a cupola cabin built in 1923. 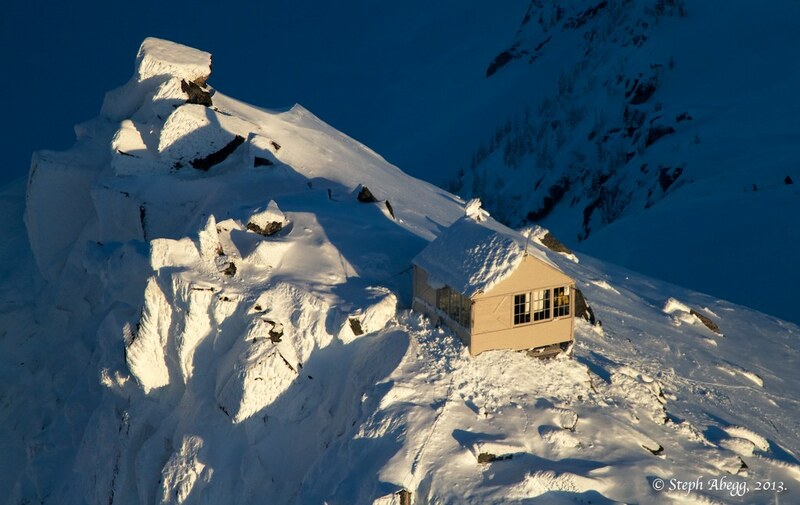 Still staffed every summer, Goat Peak receives about 1500 visitors each year! It is listed on the National Historic Lookout Register. -119.9003	 3852	 First used about 1934 with a ground-mounted L-4 cab staffed by the Forest Service, ownership was later transferred to the State of Washington. The present 40' timber tower with DNR live-in cab, built in 1966, overlooks some of the driest flash fuels in the state of Washington. The DNR contracted this tower out to Gebber's Logging Company who staffed it up to July 1997. It is presently used during emergencies, and is listed on the National Historic Lookout Register. -120 00.132	 5020	 Leecher has had a long and varied history of structures. The first was a crow's nest tree lookout dating from as early as 1918 located 1000' south of the present tower (still there). In 1921, a 45' steel windmill tower with a 6x6' cab was built, along with an 18x22' log cabin, which was replaced by an L-4 cab for living quarters in 1936. In 1954, lots of moving of structures took place. The steel tower was moved to the North Cascades Smokejumper Base for a jump training loft. 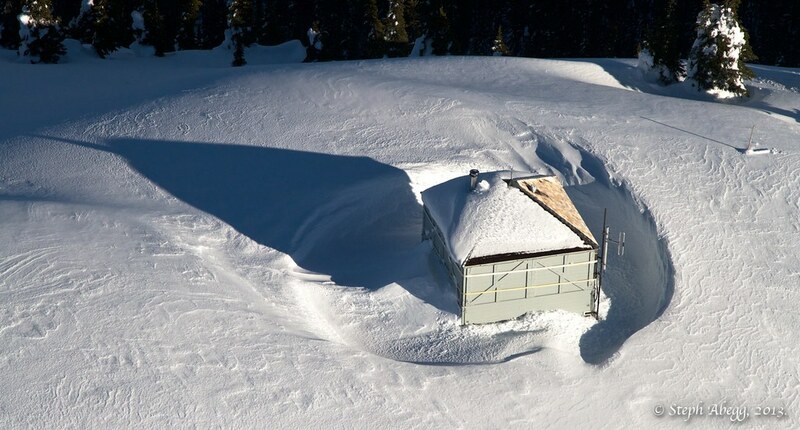 The ground-mounted L-4 cabin was moved to Slate Peak Lookout, where it was destroyed two years later for a radar station that was never built. The present 41' treated timber tower with L-4 cab was constructed the same year, with the cab coming from Chiliwist Butte Lookout, 10 mis to the east. Leecher has been used for emergency fire detection during the summer since the 1980s. -120.1862	 5515	 An aptly named summit, no one really knows the exact elevation of Lookout Mtn. Contour maps say 5515', the National Forest maps say 5522', and the summit sign says 5692'. Established as a camp lookout in 1916, a log cupola cabin was constructed in 1931. The present 25' timber tower with L-4 cab, built in 1937, was staffed regularly every summer up to 1997. Why it is not staffed full-time now is a curiousity, because this lookout averaged over a dozen first reports of fire per season. It is presently on emergency status, and is listed on the National Historic Lookout Register. -120.779806	 6960	 This L-5 cab, built in 1933, was probably abandoned in 1941. It is the last L-5 cab known to exist. Some preservation work took place in 2002, and restoration efforts were renewed in 2013 by the newly-formed Friends of Mebee Pass Lookout. -120.64522	 6520	 Located on the U.S./Canadian border, a camp with tree platform was established in the 1920s. A log cupola cabin was constructed in 1930, and was later determined it is actually a few feet inside Canada, making it British Columbia's southernmost lookout. In 1953, a 30' treated timber L-4 tower was built on the U.S. side, officially making it the northernmost lookout in Washington. Last used for emergencies in the 1970s, both structures remain intact at the end of a 10 mi trail from the Canadian side or 30 mis of trail from the U.S. side through the Pasayten Wilderness. 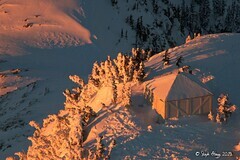 -120.068338	 7437	 Developed with a log cabin about 1920, a cupola cabin was built in 1923 and is still on the summit. A 30' treated timber L-4 replaced the cupola in 1947. The lookout was last staffed in the late 1980s. The site is listed on the National Historic Lookout Register. -120.6794	 7440	 The first lookout structure here was a 1924 gable-roof cupola cabin. The current 41' treated timber tower with L-4 cab was built in 1956, after the Air Force decided they didn't need to build a radar station here. 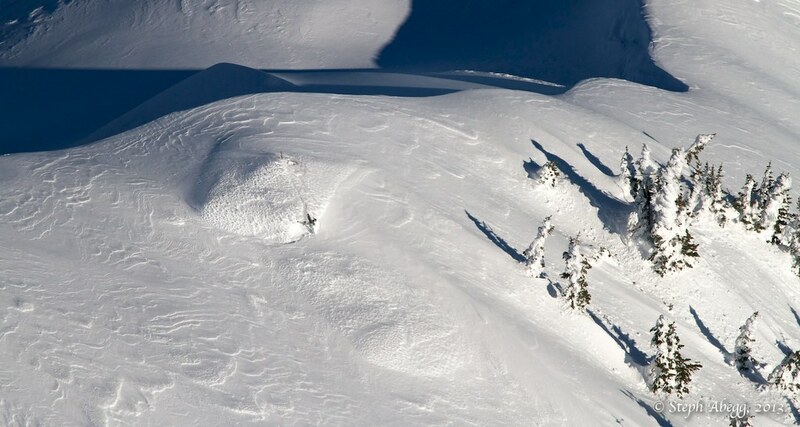 The summit was formerly 40' higher, but the Air Force kicked out the U.S. Forest Service tenant, destroyed the L-4 cabin which had been moved to the summit just 2 years earlier from Leecher Mtn. Lookout, and blasted the top 40' off the mountain. The project was declared obsolete before completion, and what remains is a huge flat summit. It is the highest point in Washington accessible by automobile. 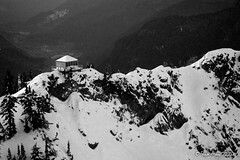 The lookout was pressed into emergency service during 1994 when nearby Goat Peak Lookout had to be evacuated because of a forest fire. It was used in 1996 to monitor the Elbow Basin fire in the Pasayten Wilderness, and relay radio messages from personnel on the fire. The lookout is listed on the National Historic Lookout Register. 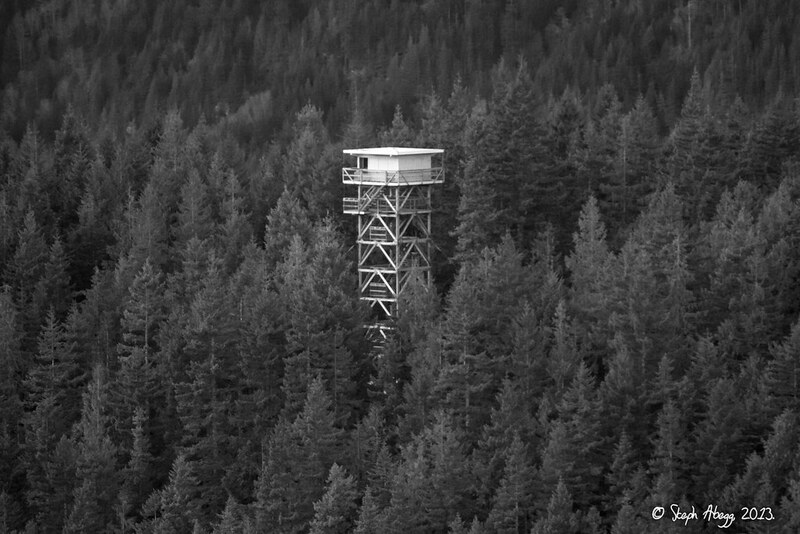 -119 14.180	 6054	 First used as a detection point by the Forest Service when a 40' pole tower with L-4 cab was built in 1933, ownership was later transferred to the State of Washington. The present 40' timber tower with DNR live-in cab, built in 1966, had stood abandoned for several years. A private party purchased the tower in the mid-1990s and has a special use permit to leave it on site. -119.08576	 4587	 This 100' Aermotor steel tower was built as the first and only lookout on this summit in 1939. The site has been abandoned since 1952. Since that time, the accompanying ground cabin living quarters and the roof of the lookout tower have departed. Etched on the walls of the 7 x 7 foot cubical on top of the tower are numerous names and dates of the many visitors, from the 1940s through the present day. -118.6624	 4764	 Built in 1931, this 45' steel Aermotor tower has been staffed most summers. It is unknown if this is the original frame cabin living quarters from that time. -118.482093	 6782	 First used in 1912 with a stone shelter 1/8 mi north of the summit, this cabin, built in 1914 of hand-hewn square logs, originally had a 15' pole platform tower above it. When a 16' pole live-in tower replaced it in the 1930s, the platform was removed, leaving the cabin intact. The building is also on the National Historic Lookout Register, and is a twin of the one on Mt. Bonaparte. Some minor preservation has been done to the cabin in recent years by volunteers from the Colville National Forest and Washington Chapter of the Forest Fire Lookout Association. -118.63231	 3786	 Developed in 1934 with an L-5 cab, a 15' treated timber tower with L-4 cab replaced it in the 1950s. The present 15' tower with DNR live-in cab, built in 1986, was last staffed by the DNR in 1995. Its low profile view of Northern Ferry County takes in mostly National Forest land. The L-4 cab from the previous tower was moved to the Molson Museum. -118.46677	 4686	 A camp lookout was started here in 1914. In 1938, a platform observation tower was built, replaced in 1963 with a 20' wooden tower with R-6 flat cab. The present 100' steel tower built in 1986 is the tallest live-in tower in Washington state and is staffed every summer. -118.4992	 6381	 This 30' steel tower with 7x7' cab was built in 1941, and promptly abandoned in 1952. Since then, the accompanying ground cabin living quarters and the roof of the lookout have disappeared. The tower has found a new use as a support for several antennas. Recent evidence suggests this tower may have come from Moses Mtn. where an identical tower was removed in 1938. 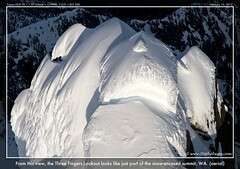 -117.039281	 5014	 Indian Mtn. is a scant 1/4 mi inside Washington from the Idaho border. A 30' pole L-4 tower was constructed in 1933, replaced by the present 40' treated timber tower with L-4 cab in 1953. The lookout is staffed in the summer and is on the National Historic Lookout Register. -118.44348	 4090	 This 100' steel Aermotor tower, built in 1938, is the only tower ever on the site, and is staffed sporadically during the summer. -118.79549	 4831	 A camp lookout was established here in 1932. Then in 1938, a 90' steel tower with a house on the ground for living quarters were built. The present 67' steel live-in tower, built in 1964, is staffed every summer. -117.510768	 3120	 Once one of the hardest lookouts for the public to access due to the road being sealed off, a 1999 housing development on the same hill has opened up the drive. Preceded by a nearly identical tower built in 1956, this 40' timber tower with live-in cab was built in 1976 and staffed every season up to 1992. It was closed the following year, but reopened during the tinder-dry 1994 fire season. It has remained unused since that time. This once extremely active lookout (as a companion to Mt. Spokane Lookout) may be removed in the future by short-sighted DNR managers who don't see the historical significance and still very practical role of lookouts. The tower is listed on the National Historic Lookout Register. -119.06126	 6774	 Started in 1914 with a crow's nest tree platform lookout and accompanying cabin, a 30' pole tower with a crude cab replaced the tree in 1923. In 1930, a 35' steel tower was constructed. The present 123' Aermotor steel tower, built in 1938, is the tallest lookout tower in the Pacific Northwest! It has been abandoned since the mid-1980s. Evidence suggests the 1930 tower was moved to Grizzly Mtn. where it was built in 1941. -119.30903	 5749	 Originally staffed by the Washington State Division of Forestry, an L-4 cab was built here in 1935. In 1968, a 20' timber tower with R-6 flat cab replaced the original cab. The present 53' all-steel live-in tower, built in 1986, is staffed every summer. -117.08234	 5200	 This 10' treated timber tower with DNR live-in cab, removed from nearby Mt. Spokane in 2001, was placed here in 2004. It is available as a rental cabin through Mt. Spokane State Park and is available for emergency detection. 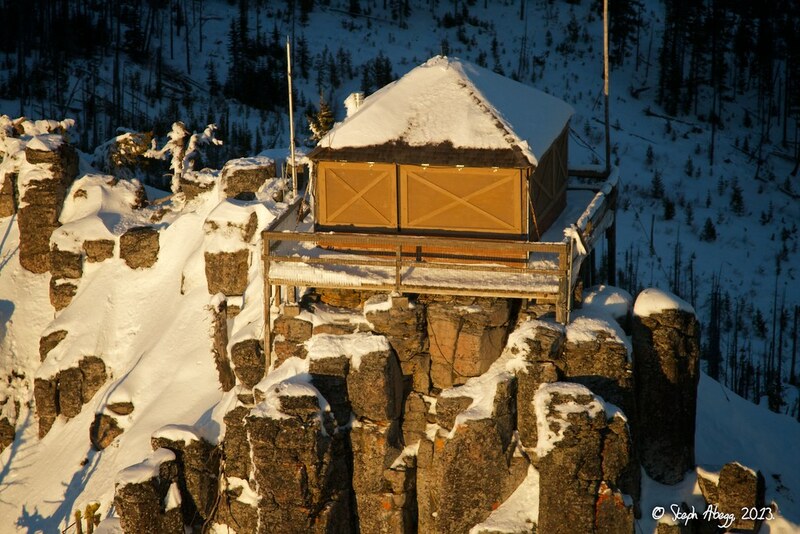 -117.102908	 6828	 Developed in 1927 with a 35' pole platform tower on the south summit and a crow's nest tree platform on the north summit, a log cabin was built at the south summit and a pole platform tower on the north summit in 1929. About 1933 a 30' L-4 was constructed on the south summit. The present 10' treated timber tower with R-6 flat cab, built on the south summit in 1964, is on the National Historic Lookout Register. The site borders the Salmo-Priest Wilderness. -117.137471	 5961	 A log cabin was first built 1/2 mi southeast of the present lookout in 1909, then a log cabin was built in 1915 on the summit. 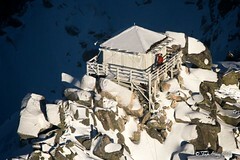 An R-3 cupola cabin was constructed in 1929, replaced by the present 41' treated timber tower with R-6 flat cab in 1960. Staffed during the summer, the tower is on the National Historic Lookout Register. -117.114174	 5883	 Built by the Civilian Conservation Corps in 1934, the second floor dormer of the present stone vista house at the north end of the summit served as the first lookout. It is listed on the National Historic Lookout Register. A series of towers replaced the stone vista house as primary lookout, beginning in 1948 with an 85' wooden live-in tower, which fell down the next winter. In 1950, a 45' pole tower with L-4 cab was constructed, replaced by a 40' timber DNR live-in tower in 1963. Another 40' timber DNR live-in tower, built in 1979, was last staffed in 1994. It was dismantled in 2001, with the cab and part of the tower rebuilt atop nearby Quartz Mtn in 2004. -118.93748	 5855	 Built in 1936, this 54' steel International Derrick tower also had an L-4 cab for living quarters. The tower was staffed into 1938, and has been abandoned ever since. The L-4 cab was destroyed many years ago by a falling snag. -117.24889	 6483	 Started in 1926 with a cupola cabin, a 20' pole tower with L-4 cab replaced it in 1937. 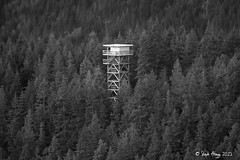 The present 20' treated timber tower with R-6 flat cab, built in 1960, borders the Salmo-Priest Wilderness Area in Northeast Washington. It was pressed into emergency service during the 1994 fire season. -117.452515	 5474	 Developed about 1932 with a 50' pole tower topped with an L-4 cab, the present 41' treated timber tower with R-6 flat cab, built in 1959, has been partially restored by the Colville National Forest & Pend Oreille Anthropological Society. It has been used off and on for brief periods during the fire season to detect fires. The tower is also on the National Historic Lookout Register. -118.1472	 4000	 This 53' all-steel live-in tower is a relative late-comer in the lookout age. Built in 1975, this is the first tower ever built on the site. It is staffed every summer. 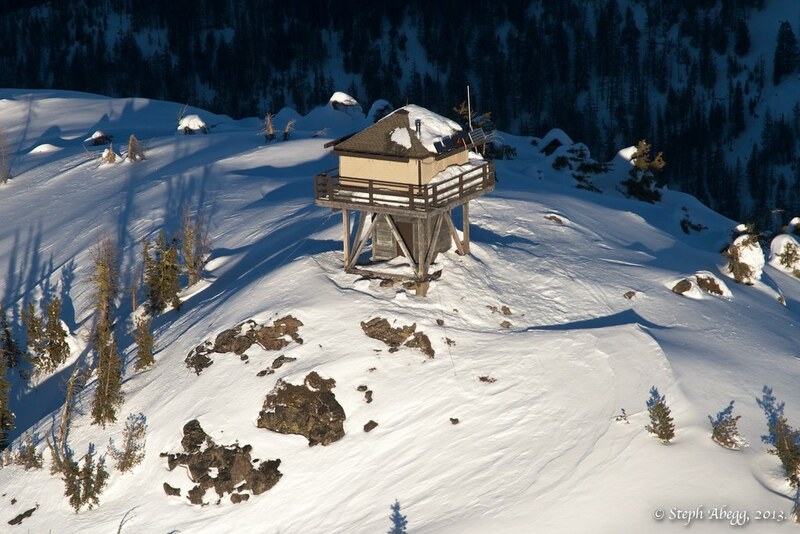 -118.02086	 3413	 This 53' steel live-in tower, built in 1964 and staffed every summer, replaced the Spokane Mtn. Lookout 4 mis to the north. 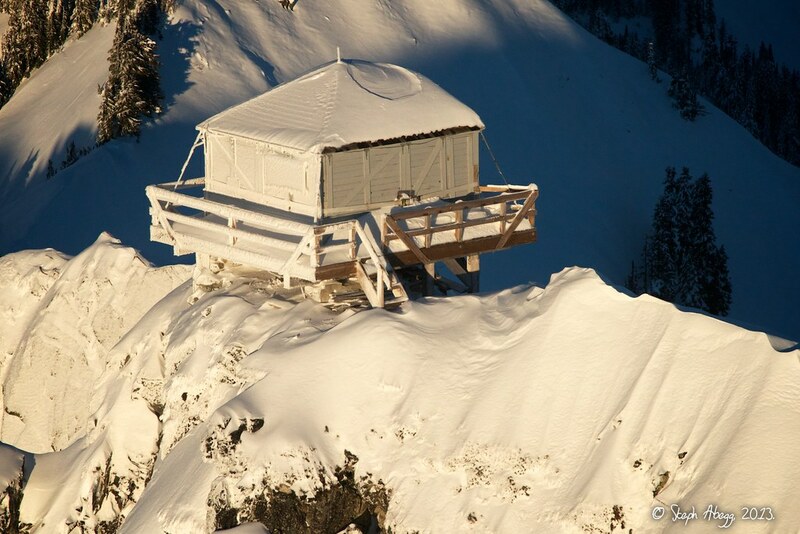 -118.50943	 4762	 A camp lookout was established here in 1922, with the first structure being a frame cabin in 1932. A 20' treated timber tower with R-6 flat cab was built in 1964, replaced by the present 53' all-steel live-in tower in 1985. It is staffed every summer. -119.24706	 3949	 A 3-legged 60' wooden tower with 7x7' cab and an accompanying L-4 cab for living quarters (still there) were built here in 1938 1/4 mi northeast of the current lookout. The present 53' all-steel live-in tower, built sometime during the 1960s, is staffed every summer. -117.2481	 5009	 Preceded by a 73' pole L-6 tower and cabin built in 1938, the present 82' treated timber tower topped with an L-4 cab was constructed in 1950 and has been used during emergencies in recent years. -117.57517	 5660	 This 82' steel Aermotor tower, built in 1938, is available for emergencies. The accompanying ground cabin living quarters is on the Recreation Rental program. -117.679203	 6387	 Built in 1931, this gable-roof L-4 cab is staffed every summer. The site is located in the Wenaha-Tucannon Wilderness. -117.91197	 6250	 First used with a D-6 cupola cabin in 1929 (which survived until at least 1958), the present 10' concrete base with L-4 cab was built in 1949 and is staffed every summer. The cab was modified in 1989. 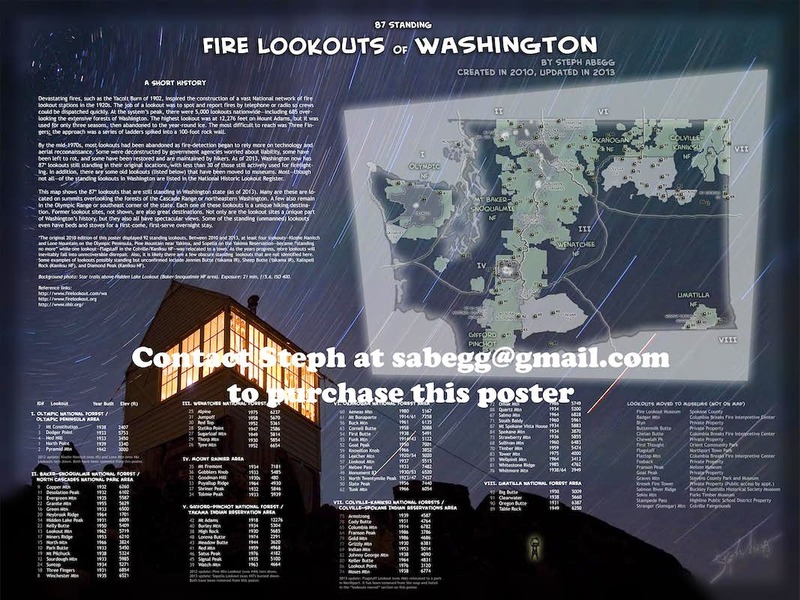 2014 Update: Possible corrections to the fire lookout list on this page: On August 3, 2014, fire lookout enthusiast Craig Willis became the first (documented) person to visit every standing fire lookout in Washington. He claims some minor differences between his list and mine, to bring the total standing lookout structures to 93. In the interest of being as up-to-date and correct as possible with the information I put on my website, I have included below Craig's detailed notes of the differences between his list and mine. I wanted to contact you because your list of Washington fire lookouts is not correct. I know there are some people who use the list on your website, so I think it is important for the list to be as accurate as possible. I have written confirmation from within the FFLA that the list I compiled is correct and not missing anything. I became the first person to complete the list, at Three Fingers on August 3, 2014. -> Whitmore Mountain and Mount Leecher each have two lookout sites appearing on the list I compiled. This is important to inform people. The reason is because both peaks have two lookout sites at distinctly different locations which cannot be seen from ground level between one lookout site to the other. Hence, in each such case both distinct lookout sites must be visited. I know on your poster and list you have slashes (/) with different years to represent multiple lookouts on the same peak (which is a good, clean way to do it)... but I think it is important for people to know about the ones which have totally different areas that need to be visited. People need to keep in mind that a fire lookout list is not the same as a peakbagging list; visiting one of two sites on a peak is not enough. -> The Okanogan Post Office and Darrington Ranger Station lookout sites are included on the list I compiled because despite the rooftop firewatching platforms no longer being present the lookout buildings are still standing & intact. 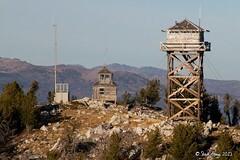 These two lookout sites are generally accepted on the list by prominent Forest Fire Lookout Association (FFLA) members, including Ray Kresek and Rex Kamstra (he shows both on his statewide standing lookouts map), and are considered the simplest visits of lookout sites on the entire list. -> You have a notation regarding Diamond Peak. 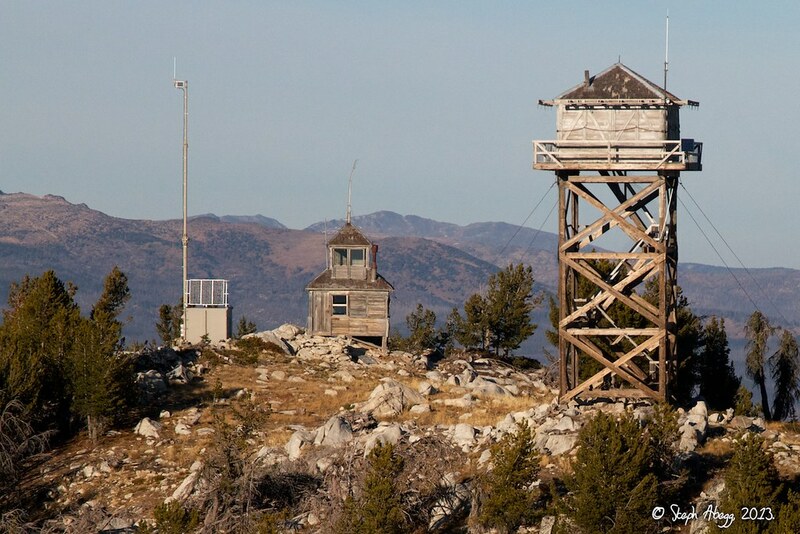 In northeastern Washington, the lookout tower at Diamond Peak's summit has long since been gone. However, the Diamond Peak Patrol Tower is still standing, located east of the peak a short distance beyond Point 4413. It is like a much taller Ned Hill Lookout... but much taller and much cooler to see. -> You have a notation about Jennies Butte and Sheep Butte. Jennies Butte has been confirmed from a firsthand visit as no longer having a standing lookout tower, and should not be on any list. Sheep Butte is an odd one; it does not appear in Ray Kresek's book or within any of the three online website you list as references. Eric Noel had put it on the original Peakbagger.com list but later wondered if that was an error. Someone went there and found no standing lookout, wondered why it was even on the list, and then later it was removed from the Peakbagger and SummitPost lists. Sheep Butte should not be on any list. -> You also have a notation regarding Kalispell Rock. Kalispell Rock is a cool peak but should not be on the list. The lookout building that was atop the massive summit boulder has long-since been gone. There is a cabin next to the boulder outcrop which has a collapsed roof. However, that cabin was never used as a lookout. It is quite obvious when you stand at the cabin that it has an extremely limited outward view. As confirmed by Ray Kresek, the cabin was only used as living quarters and never as a lookout. Most cabins at lookout sites were only used as living quarters and not as lookouts, so it is important not to confuse the two types. -> Lynx Mountain is included on the list I compiled. The first lookout structure built on the peak was a log cabin during 1926. 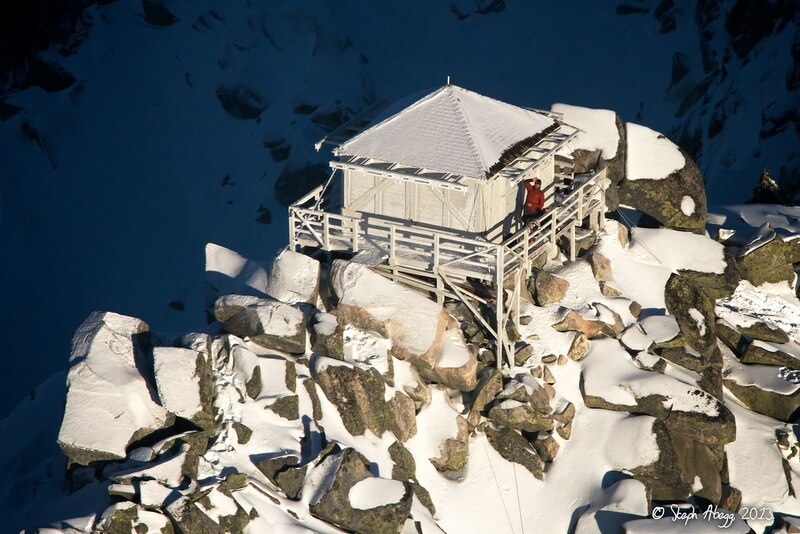 The cabin was abandoned as a lookout after a frame cab was built on the west peak during 1932, and later a tower atop the true summit during 1938. But now only the cabin still remains as an original lookout on the peak. Nearby trees have grown up to prevent unobstructed outward views but when the cabin was originally built it would have had a great view down the valley to the southeast towards the community of Inchelium, which would have been important. Your current list has 87 lookouts. -> If you add Diamond Peak Patrol Tower, it goes up to 88. -> If you add Lynx Mountain, it goes up to 89. -> If you add Okanogan Post Office and Darrington Ranger Station, it goes up to 91. -> If you split up the multiple distinct lookout areas on Whitmore & Leecher, it goes up to 93. Then both lists would match.